The Four Seasons and the Beach Boys were virtually the only American groups whose successful careers were not derailed when the Beatles and the British Invasion bands hit the States in 1964. In fact, 1964 ranks as the Four Seasons' biggest year of all, despite the insurgency from abroad, which attests to their durability and appeal among America's teenagers. 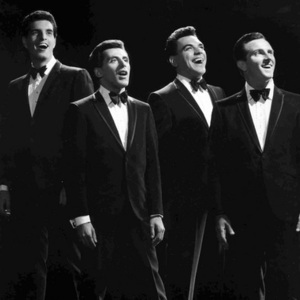 That appeal stemmed from the Four Seasons' ability to complement spotless Italian-American doo-wop harmonies with the forceful falsetto and three-octave range of lead vocalist Frankie Valli - the other members were Bob Gaudio on keyboards and tenor vocals, Tommy DeVito on lead guitar and baritone vocals, Gerry Polci on drums, and Nick Massi on bass guitar and bass vocals. Frankie Valli and Tommy DeVito previously performed with Nick DeVito (Tommy's twin brother) and Hank Majewski as the Four Lovers. later on the Four Season where heavley shaped by the songwriting of band member Bob Gaudio, with arrangements and production that drew upon everything from Phil Spector's "Wall of Sound" to the danceable beat of Motown's pop/R&B singles. During a hitmaking streak that spanned the years 1962-68, the Four Seasons netted two dozen Top Forty singles, including the Number One hits "Sherry," "Big Girls Don't Cry," "Walk Like a Man" and "Rag Doll." They've sold over 100 million records worldwide, making them the most successful white doo-wop group in rock and roll history. At their peak, the Four Seasons made recordings that expressed the tough-but-tender sensibility of their home turf in the Northeast much in the way the Beach Boys encapsulated the world of Southern California in harmony and song. In the words of Billy Joel, a longtime fan who grew up listening to them on Long Island, "The Four Seasons had wonderful chord progressions, beautiful writing, terrific production fantastic harmony, records that really spoke to us." The band released their first hit "Sherry" in 1962. Under the guidance of producer/songwriter Bob Crewe, The Four Seasons followed up "Sherry" with several well-remembered hits, including "Big Girls Don't Cry", "Walk Like a Man" and "Candy Girl". In the mid 1960s, the British Invasion slowed down their career somewhat, but the Four Seasons released several more big hits in 1964, such as "Dawn", "Rag Doll", which was the first single on WABC Radio, New York to be "pick hit of the week" one week and the number 1 single the following week, "Big Man in Town", "Ronnie" and "Save It for Me". Nick Massi left the Four Seasons in 1965 and was replaced by Joe Long who became the mainstay on bass and backup vocals until 1976. Several more Top 10 singles followed, including "Let's Hang On", "Working My Way Back To You", "Can't Take My Eyes Off You", and "C'mon Marianne"; but by late 1967, the group's popularity was deteriorating, as public interest moved towards rock with a harder edge and more socially conscious lyrics. The band would, however, enjoy a brief revival in their popularity in the mid 1970s, with the hits "Who Loves You", "Swearin' to God", and their last number one hit "December, 1963 (Oh, What a Night)".